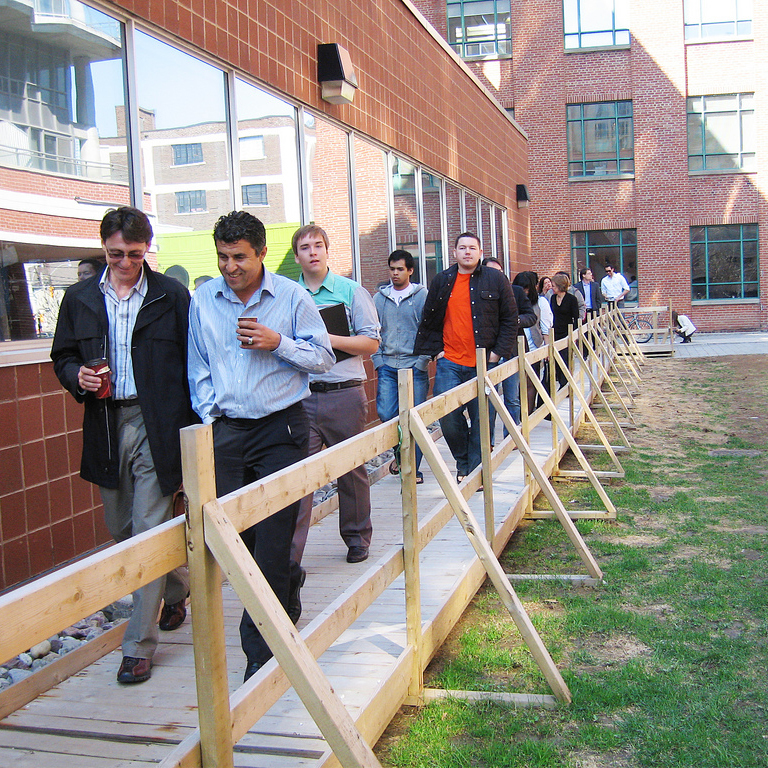 In 2009, the IwB was approached by the George Brown College (GBC) administration to explore new uses for an underused space on the St. James Campus. 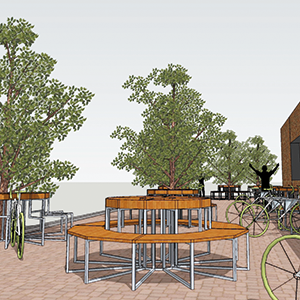 The site was considered for several purposes, but the focus became creating a bike storage facility that would consider the broad personal transportation needs of the entire College and be adaptable for all the GBC campuses. To this end the IwB conducted a 5-day charrette from April 27th to May 1st, 2009 and proposed a plan for a bicycle storage facility called Bike Line. Improving support for bicyclists to the GBC campus is a smart move that will have many positive long term effects. The goal of the project was to investigate and support the changing transportation needs of the GBC students, faculty, and staff by designing an efficient, modular bike storage that considered the user’s needs, physical site constraints, and legal concerns of a new bike storage facility for the College. The charrette brought together GBC administration and the College’s Green Team, members of the local cycling community, representatives from the City of Toronto, and other stakeholders. The site chosen for concept implementation was an L-shaped residual space on the St.James Campus that lines the Financial Services Building at 290 Adelaide St. along the North and East sides. The challenge was to design a bicycle storage system that would set a new standard for environmental mandates and corporate social responsibility policies within GBC. The design had to address personal safety and security issues for cyclists, identifying and proposing ways to deal with theft, damage, and accessibility. It also had to consider varying levels of users and uses, acting as a hub for cyclists and community members, but also as a less-frequented public rest area for student passersby. Several of the charrette team concepts were fused together and further developed into a proposal called Bike Line. Bike Line included vast site improvements and proposed a new vibrant, red steel rail that would provide a visual and physical infrastructure for a variety of modular elements that could be suspended from this central skeleton. 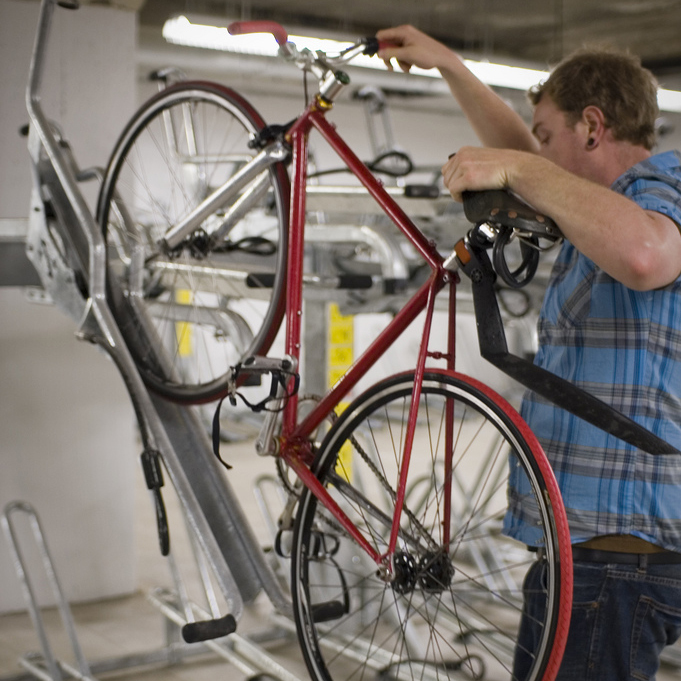 These elements would include 3 distinct types of bicycle storage that provide short, medium, and long term storage. The Bike Line elements could be replaced or moved around to accommodate alternative uses, be easily adjusted to fit another location, and be developed further with new modules that might add new functions in the future. In addition to the proposed site improvements, the Bike Line design also included programming support like bike locker rentals and community information as well as a new wayfinding system. Thus, Bike Line could become a physical link for the campus, connecting different areas and buildings and acting as a backbone for wayfinding throughout the campus and surrounding neighbourhood. The Bike Line design set a new standard for socially and environmentally responsible campus development at George Brown College. It addressed the development of a college-wide bicycle strategy and the exploration of alternate means of transportation, responding to issues of bike safety, storage, and security and anticipating the changing face of personal urban transport. For more information see the GBC Bicycle Storage Strategy Design Charrette Report.